Solaire Infrared Grills are the Best Hot Grills available. A small grill with the same power as the larger ones, the 21 can fit into most yards or balconies while offering the same cooking ability as the other grills. Don't just take our word for it, try it 1st for yourself with our demo rental grill and taste the difference! Built In: W = 21", L = 20", H above counter (Hood Down) = 12", H above counter (Hood Up) = 20 1/2"
Angular Pedestal: W (Shelves Down) = 27 1/2", W (Shelves Up) = 45 3/8", L (Hood Down) = 20", L (Hood Up) = 20 1/2", H (Hood Down) = 46 1/2", H (Hood Up) = 55"
The grill ships fully assembled. It only needs to be removed from packaging, placed outdoors in the desired area, and connected to a source of gas, either Propane or Natural gas, depending on which type is ordered (it can be converted later after the purchase of a conversion kit if your gas needs change). Is your island made from combustible material (such as wood or plastic)? You will need the Insulated Jacket, Item #SOL-IRIJ-21 (see item for cut-out dimensions). 20" width, 16 1/4" depth, 7 7/8" height. Note: Minimum 3 5/8" clearance required between edge of cutout and inside back wall of enclosure for gas regulator. Built in grills are designed to just be simply placed into an outdoor kitchen and are supported by the back and sides by the counter top. If desired, silicone sealant may be used around the edges to help secure your grill, but this is not required. 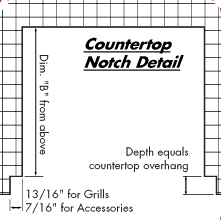 If the counter top of your island overhangs the cabinet face, the counter top must be notched to accommodate the control panel or front of the Solaire equipment. Limited Lifetime Warranty on Stainless Steel, Burners and Grates; two years on ignition system components; one year on everything else. Nominal shipping/handling charge for warranty items shipped. Click the button below to add the 21" Solaire Infrared Grill to your wish list.